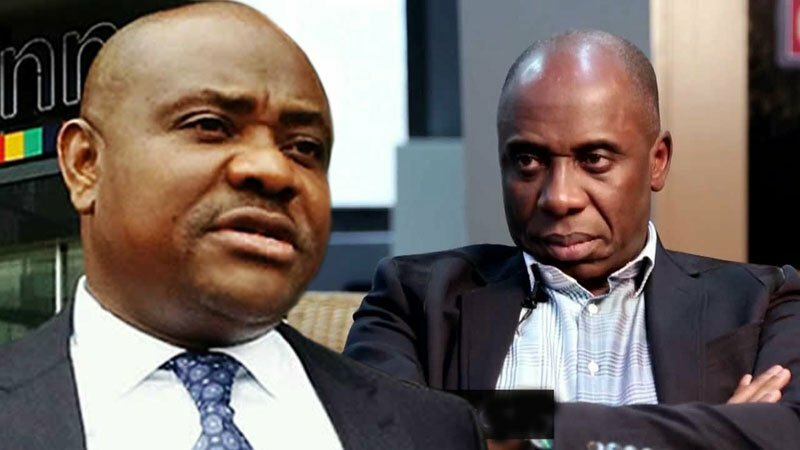 The Rivers State chapter of the All Progressives Congress, APC, has revealed why the state Governor, Nyesom Wike hates President Muhammadu Buhari and the Minister of Transportation, Rotimi Amaechi. The state arm of the party claimed that Wike hated Buhari and Amaechi because they masterminded the removal of the immediate past president, Goodluck Jonathan in 2015. Rivers APC made the claim in a statement signed by its Chairman, Davies Ikanya’s Senior Special Assistant on Media and Publicity, Eze Chukwuemeka Eze, on Monday. Eze also dismissed Wike’s claim that Buhari was under pressure to declare state of emergency in the state. The statement reads, “Wike’s hatred for President Buhari and Amaechi is legendary, since the two APC leaders masterminded the ouster from office of his ATM, Dr. Goodluck Jonathan, under whose watch our common patrimony was looted with impunity. “Because of this, he is ever ready to use any forum to castigate, insult and malign these two great leaders, not minding the dire consequences. “President Buhari never complained to Wike of any pressure to declare a state of emergency in Rivers state. We are shocked that Wike could bring the exalted office of the governor to odium, in such a reckless manner, to ascribe to President Buhari something he never said. “To the best of our knowledge, the three issues that Wike discussed with President Buhari were Ogoni clean-up, the Nkpogu Junction (Port Harcourt) incident with Amaechi, where attempt was made on the life of the Transportation Minister and the detention of Wike’s Chief Security Officer (CSO) for one week. “Nobody is interested in declaring a state of emergency in Rivers state, not minding the abysmal failure of Wike to ensure protection of the lives and property of the people of Rivers State.